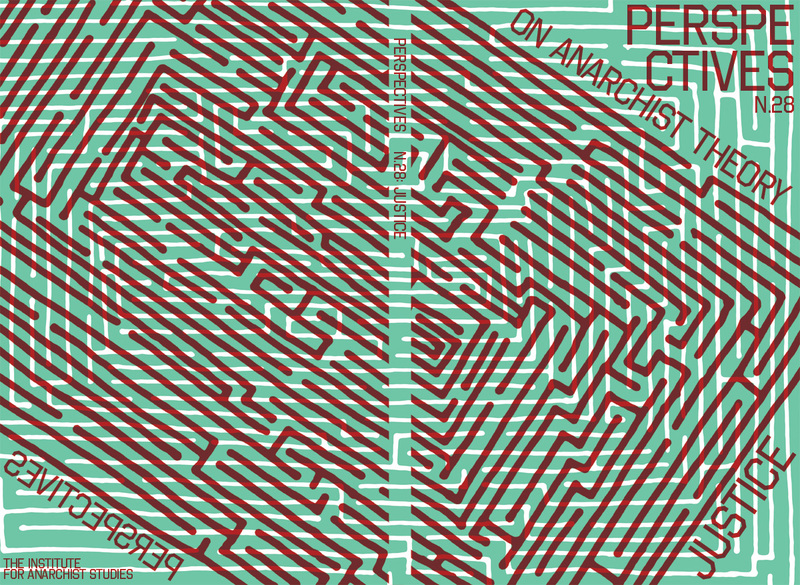 The introduction to the new issue of Perspectives on Anarchist Theory, available from AK Press. We know what injustice is. We know instinctively from the time we’re little. Even if she can’t describe it, a child’s protestations of “That’s not fair!” “He cheated!” “She got more than me!” “That’s not FAIR!” signal what she senses on principle. Is it a code of ethics, how you’re supposed to treat people on the individual, interpersonal level? Or is it that which promotes conditions for what is fair and equitable on the structural, systemic level? Another thing that isn’t fair: having rules applied to you that you didn’t agree to play by, or didn’t play some role in developing. Justice—its withholding, and its contested meaning—is a resonant theme at this particular moment in the US, as we participate in and witness the recent uprising in response to the non-indictments against cops who murdered Eric Garner and Mike Brown. The outrage that has boiled over since last August, when Mike Brown was shot seven times for walking in the street in Ferguson, Missouri, is in response to what people rightly see as a lack of justice. Darren Wilson, the cop who shot Brown, and Daniel Pantaleo, the officer who choked Garner to death, literally got away with murder. Clearly there is no justice from the US legal system for people of color, and for the poor, and for the working class. 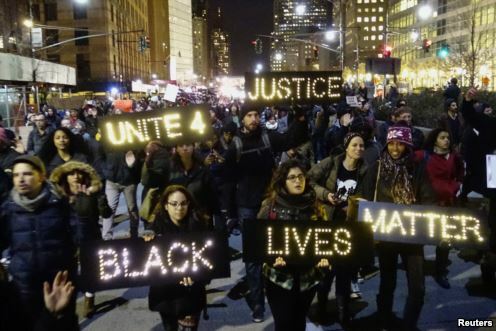 Black Lives Matter is the new civil rights call, updating earlier calls for Black Power. People want justice, and they didn’t get it. The type of “justice” administered by law enforcement is reprehensible. The guiding philosophy of “broken windows,” in which police confront small, petty offenses, is exactly what led to these two high profile deaths; one for jay walking, the other for allegedly selling loose, untaxed cigarettes. Yet, as the two week work slowdown enacted late in 2014 by the New York Police Department (in response to what was perceived as a slight by Mayor DeBlasio) shows, this philosophy of confronting otherwise insignificant violations is really about controlling poor, working class, and Black and Brown communities. Ironically, the NYPD’s work stoppage backfired, demonstrating the argument in favor of police abolition: plainly we can live together without the police. The days without policing demonstrated that much of their everyday brutality has little to do with ensuring justice, and more to do with keeping people intimidated and in line while raising revenue for cities, as was found to be the case in Ferguson. Neither the police on the streets, nor the lawyers and judges in the courts, ensure justice. If anything, they ensure injustice. The US has locked up millions of poor whites, Blacks and other people of color to become the highest per capita incarcerator of its own population, creating what’s become known as the Prison-Industrial Complex. And this is not even to speak of economic justice, the idea that one should be paid the full worth of one’s work. Under capitalism, the owner keeps a percentage of the wealth created by the worker, a process Karl Marx referred to as the extraction of ‘surplus value.’ Capitalism at its core is an unjust economic system, requiring inequality in order to function. Truly there can be no economic justice within this system. Finally, how is it just that today’s society is condemning future generations to a climate- devastated world: a world of rising seas, of drowned cities and entire island nations, of drought, famine and intolerable heat waves? How is it just for us to go about our lives without trying to prevent this from occurring, when the majority of climate scientists warn us of what is to come if we don’t fundamentally change the way we operate? Where is the justice for those who will inherit the Earth? No Justice, No Peace: This is not a threat but an inarguable prediction, and a logical outcome. Hence the sustained protests and riots that accompanied the non-indictments of the killer cops. Conditions that are not viewed as fair and equitable cannot be tolerated for long without dissent and opposition. They are unstable. Yet that very instability and volatility isn’t just a “threat to peace” but may be necessary in order to unsettle an unjust status quo and create something new. And do we need something new! A “justice system” isn’t the same as a “legal system.” To see which one we’re dealing with, we need to ask questions like, what ideas motivate its procedures? What purpose are its mechanisms supposed to serve? Some are oriented toward the ideal of upholding order and stability, others the ideal of transformation or redistribution. The meting out of justice may be aiming at restoration, retribution, revenge, or punishment. What constitutes legitimacy? Who gives consent, and by what mechanism? Again, we see underlying differences in political philosophy: assumptions about what conditions are the right ones, and whether or not the existing conditions approximate the ideal or not. If they do, you probably want to protect stability. If they don’t, you may want to destabilize and create openings for change. In the existing system, when we say, “that’s not fair!”—what’s not fair? Obviously differential treatment or exclusion, whether based on categories of race, ethnicity, gender, sexuality, ability, or anything else, is not fair. Different access to resources. Different reward for the same work. Different penalization for the same transgression. Not fair. However, enforced uniformity without regard to our differences is also unfair. Or inflexible treatment without regard to context. We in the radical community have these struggles with justice. When one amongst us commits a violation of the rights or dignity of another, we seek to exact justice without relying on a legal system that we rightly see as fundamentally flawed. We sometimes establish accountability processes. The best amongst these efforts are guided by principles of restorative justice: the belief and hope that in holding people accountable, they can be redeemed, they can change, and justice can be achieved for those who were hurt while the community can begin to heal. Such accountability processes are to be commended, as they represent attempts to develop new, more genuine forms of justice, prefiguring a more liberated and free society. But even these processes are not without their own set of problems. We need to be on guard against developing a mob mentality, in which a community turns on the accused, without the patience and information necessary to discern just what happened. Some of these failed efforts at accountability demonstrate that certain principles of the dominant legal system are worth retaining: namely ideas such as ‘innocent until proven guilty,’ the right to ‘face one’s accusers’ and to be judged by one’s peers, and the need for charges to be substantiated. The survivors of sexual abuse, physical or emotional violence, must be centered in our practice, and not themselves put on trial. But we must also develop processes that ensure the rights of the accused, while honoring the experience of those who have been hurt. This is difficult, but necessary, and we can do it much better than it has been done. In short, developing alternative forms of justice requires not only the cultivation of compassion, but also continuous reflection and analysis of what our communities deem just, for in this way our movements can be welcoming to the newly radicalized, growing beyond our currently limited numbers. We need to work with people where they are, challenging them, certainly, but without condemnation. It does no one any good to remain an insular clique, with obscure, unnamed rules, hostile to outsiders. We need to be transparent and open as we work to create a more just—fair—world, coming together with thousands, and ultimately millions, in the project of making the world anew. The Institute for Anarchist Studies (IAS), established in 1996 to support the development of anarchism, is a grant-giving organization for radical writers and translators worldwide. To date, we have funded over a hundred projects by authors from countries around the world. Equally important, we publish the Anarchist Interventions book series in collaboration with AK Press and Justseeds Artists’ Cooperative, the print and online journal Perspectives on Anarchist Theory, the Lexicon pamphlet series, and our new series of books in collaboration with AK Press beginning with Octavia’s Brood. We organize educational events such as Anarchist Theory Tracks, onetime talks, and in the past, the Renewing the Anarchist Tradition conference. The IAS is part of a larger movement to radically transform society. We are internally democratic and work in solidarity with people around the globe who share our values.